Here's a situation I'm sure many a craft beer aficionado understands. You're at a party and someone spots you with something that isn't a Bud Light, Corona, PBR etc in your hand. The start to engage you in conversation by saying "Oh, drinking one of them weird beers I see." Now, since it is a party it's highly likely you aren't bringing some ultra limited double casked Imperial something or other but most likely something that can be found at any decent grocery store like a Sierra Nevada, Anchor Steam, Bell's or what have you. No matter how you go about telling them that what you are drinking is fairly normal/not weird at all they'd rather not listen and then just tell you how they can get a 12 or 18 pack or whatever and "get hammered all night". In those cases all you can do is shrug and say "Oh cool" and slink away. 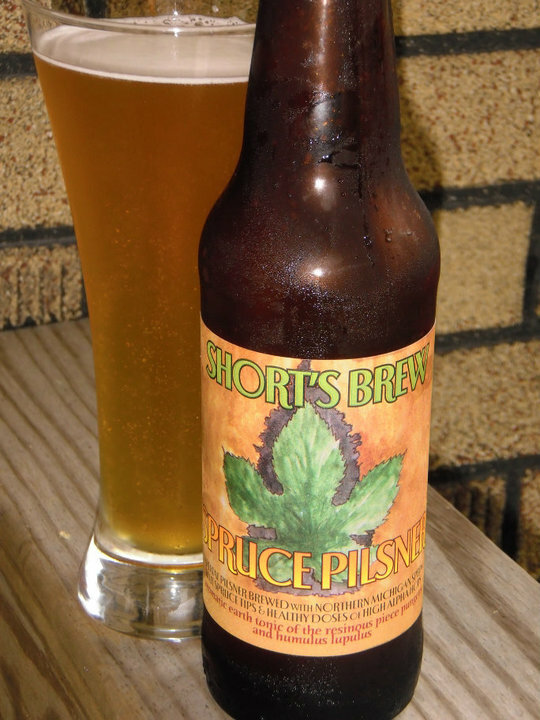 In the case of Short's Spruce Pilsner and in that situation though I would have to say "Yep, It's a pretty weird beer." Clear golden in color with a modest head that leaves some interesting looking lacing behind. Let it breathe for less than a minute and you'll seriously find yourself looking around to see who dragged a Christmas tree into the house. Well, I did at least. Beneath the northern Michigan pine forest on a breezy early spring day scent are some citrus hops peeking out. My initial thought on the flavor was some high end gin with ginger nuances. The pine flavor is really stands out on the first sip and is there all the way from start to finish. And when I say pine I'm not talking the pine qualities a lot of hops have in IPA's or Double/Imperial pilsners. I'm talking "Yep, they aren't kidding when they say on the bottle that it's brewed with Michigan spring blue spruce tips." Nope, not extracts or oils from them but the actual tips of the trees. Letting it breathe and warm up in the glass slightly the spruce pulls back a bit and the bright and tangy lemon/lime like hops come out a bit more. The finish packs the pine back in tasting somewhat minty in the end. You'll feel warmth all over your body as each sip goes down but not a burn that you might think with what was used to brew it not to mention it's 10% abv. Surprisingly, though the brew does have a lot of body and a semi-fat mouthfeel it's slightly (but only slightly) less oily feeling than I expected and very sticky none the less. Definitely a sipper here. I don't think I could ever sit down and have a 6 pack session with them because the flavor is way over the top but I do plan to pick up another six of these before they're gone and pop the cap on one when the mood for something quite interesting and way different hits me. It reminded me of chewing on pine needles which is something I'm not to sure I like.